Does having an off-season Jalopnik feature on your team count as the Jalopnik Bump? That’s exactly what happened with the Mini JCW Team, whose No. 73 car finally got the team’s first win this afternoon in its first Continental Tire Sports Car Challenge race of 2017 at Daytona. 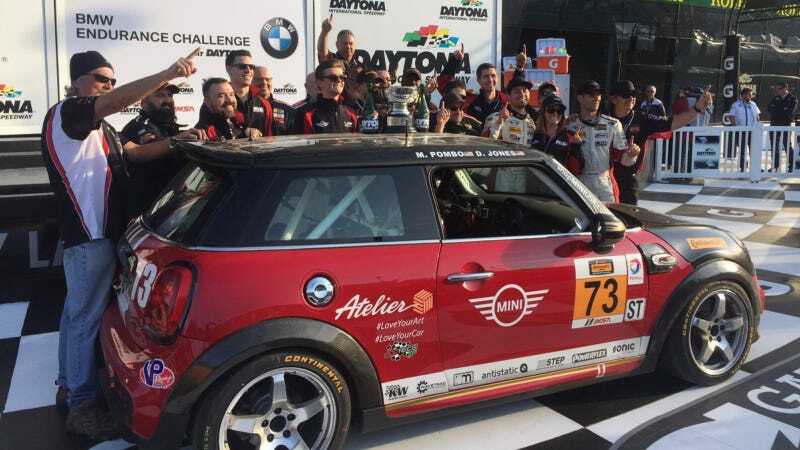 Drivers Derek Jones and Mat Pombo finally—finally!—after years of trying put the beloved Mini on top of the podium. Curiously, Daytona—where your top speed on the banking matters so much in a race—wasn’t the track where they thought they’d get that win. “It’s not the aero car for Daytona, so this is kind of unexpected,” said Jones in a post-race press conference, referring to the Mini’s blocky shape. “It’s essentially a breadbox,” explained Pombo. He said the car “punches a really big hole in the air,” and thus, it’s easy for competitors to come up on its rear. That breadbox managed to fend off the far sleeker No. 56 Porsche Cayman of Murillo Racing to take the ST class win thanks to its ability to carry speed through corners, per the drivers. Either way, I think it’s now been proven: the Jalopnik bump is still real, only it works in mysterious ways. In the GS class, a broken axle ruined the pole-sitting No. 59 Ford Mustang GT4's day, taking it out of contention early. Ultimately, a small herd of Porsche Cayman GT4s took the top four finishing spots during the race, with the No. 12 Bodymotion Racing Porsche Cayman GT4 taking the win.